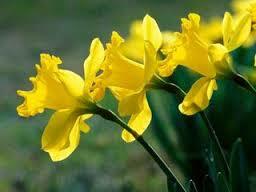 Rainer Maria Rilke exclaimed, “It is Spring again. The earth is like a child that knows poems by heart.” Truer and more beautiful words are rarely spoken. Yes, Spring is indeed here again, and it seems like the earth is more than willing to share with us her good gifts of flowers, rain, fresh air, and the vibrant colors we so missed in Winter. Replace heavy for light, dark for bright – After months of Winter’s heavy wools and flannels, no doubt you are more than ready for the lightness of muslin, linen and other Spring-friendly materials. Such fabrics are best chosen in delicious shades that mimic the soft beauty of nature. Toss a brightly colored throw across your couch, lay cheery pillows on your bed, and place fluffy pastel towels in your bathroom for a cheap and easy home makeover. Display fresh flowers – Fresh flowers; what other two words evoke remembrances of the fragrance of freshly cut lilacs, the lemony yellow hue of new daffodils, and the silky feel of tulip petals? A simple vase of fresh flowers on your kitchen table is a powerful reminder that Spring has arrived with Summer on its heels. A milk bottle full of daisies would also make a charming addition to any bedside table. When it comes to decorating with flowers, the sky is truly the limit, so be creative and fearless. Serve fresh produce – This Spring, fill your meals with fresh produce, the ultimate feast for the senses. 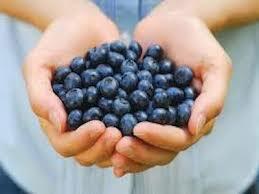 To optimize your health, choose mostly local produce. And, don’t forget that smoothies are perhaps the best Springtime treat of all. Is your home ready for Spring? How do you prepare your haven for this dearly beloved season? Share your comments with us today. This entry was posted in Decor, Flowers, Spring, spring crafts, Spring Flowers and tagged Art, bright, decor, decorate, flower, flowers, fresh, home, Light, prepare, ready, spring, springtime, tips on April 9, 2015 by segmation. Colors add beauty and variety to the world around us. They are pleasant from every perspective – expect the dark. After all, color cannot be seen without light. Or can it? This is true most of the time. There is only one exception: items that glow in the dark. The persistence of the phosphor (or the length of time the product will glow). After becoming charged, a phosphor will illuminate. This item can be seen in the dark where other colors cannot be seen. Toys “R” Us seems like the keeper of all-things glow in the dark. In everyday life these items seem far and few between. But adults use phosphors every day. Television screens, computer monitors, and fluorescent lights all have phosphors. TV screens actually have thousands of phosphors that emit red, green, and blue. Fluorescent lights have many color combinations that make light look white. The charge that generates TV and lights comes from electricity. But other phosphors use different types of energy to charge. Much of the time, natural energy is used. 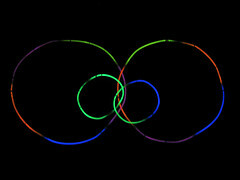 For instance, glow in the dark toys are often energized by normal light. To capture this charge and maintain it for some time, two phosphors are common: Zinc Sulfide and Stontium Aluminate. These chemical substances can be mixed in with plastic to create a toy that glows. Some glow in the dark items do not need any charge. Take watches for example; a watch may use a combination of a phosphor and radioactive element. The radioactive part can continually charge the phosphor. With phosphors, light can thrive in the dark. Better yet, items can glow. Image made available by tlr3automaton on Flickr through Creative Commons Licenses. This entry was posted in color theory, glow in the dark, prisms and tagged "The Pixel Painter", color, color theory, Fluorescent lamp, Glow in the Dark, Isaac Newton, Light, light and color, online games for kids, Phosphor, Prisms, Segmation, Zinc Sulfide on December 19, 2013 by segmation. The unique art of James Turrell infuses space with light. The artist makes entire rooms, museums, and even craters his canvases by transforming large areas into viewing experiences that manipulate how observers perceive their environments when natural and artificial lights alternate. This post explores James Turrell’s approach to art by briefly exploring how light manipulates space, how light changes perception, and the necessary relationship between light and art. At the conclusion, there are resources to inspire further exploration into this intricate subject. This offers a little help in grasping how the absence or presence of light changes our perception of space. To further explain, Turrell points up. He says this earthly phenomenon is best understood by looking up to the atmosphere we experience every day. In the light of the sun, it is impossible to see stars. However, as the sun goes down, an individual’s penetration of vision goes out, and the stars become evident again. Stars, which are constant in placement, are only visible lights when our eyes are able to perceive them as such. This can only happen when sunlight is mostly absent from our view. Artists have always looked at the world with curious fascination and longing to use light as a means of creating space. This is why, when artists began using lights, shading, and perspective within paintings, the world marveled at how lifelike the images became. The reality is, like Turrell, artist have always seen what does not exist because they have brilliance all their own. 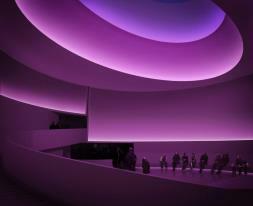 James Turrell’s first exhibition in a New York museum, Guggenheim , since 1980, opens June 21 through September 25, 2013. 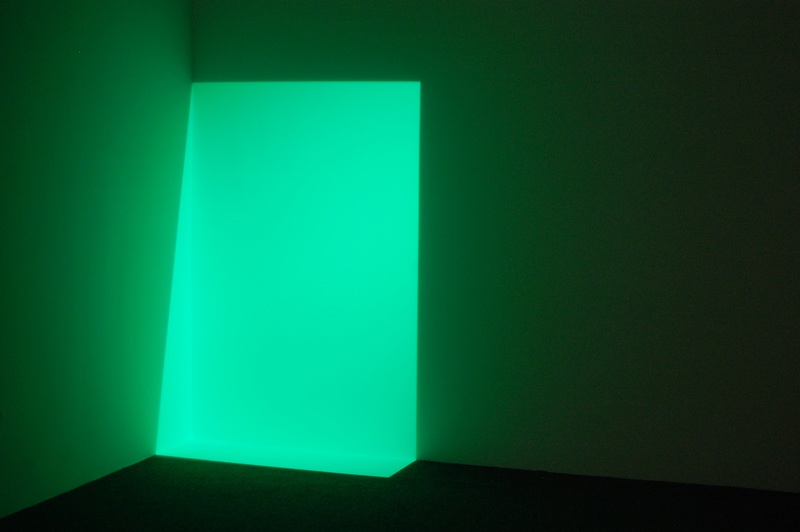 James Turrell is also in Los Angeles at the Los Angeles County Museum until April 6, 2014. – Are Your Colors What They Seem to be? This entry was posted in "out of the box" art, American, Art, Artist, color wheel, colors, Guggenheim, James Turrell, Light, perception, Space and tagged Art, art perspective, artspace, color, color wheel, iPad, iPad art, James Turrell, Light, light and art, Los Angeles, manipulate space, New York, Paint by Number, paint by numbers, relaxing on June 21, 2013 by segmation. This entry was posted in "out of the box" art, American Artists, Artistic Style, Artists, Artspace, Color, color wheel, Light, perception, Perspectives on Color, Space and tagged Art, art perspective, artspace, color, James Turrell, Light, light and art, manipulate space, Paint by Number, paint by numbers, relaxing on May 30, 2013 by segmation. Thomas Kinkade’s death on April 6th of 2012 came as a shock to both the art community and the public at large. Kinkade, known as “The Painter of Light,” was made famous by his works of art. His prints were wildly popular and sold millions. This is proven by the reported fact that 1 in 20 Americans has a Kinkade print in their home. Without a doubt, Thomas Kinkade was, and remains, a celebrated artist. Though Kinkade is no longer with us, his art remains. His last work (from what is currently known) was shown in Cape May, New Jersey, at the Victorian Walk Gallery in August of 2012. The piece, “Away From It All,” displays a cottage in the woods, a crescent moon, and, of course, emanates painted light. The Victorian Walk Gallery displayed “Away From It All” during “The Thomas Kinkade Legacy Celebration.” Patrick, Kinkade’s brother, gave a presentation about the painting at its showing. 3,000 people arrived at the Victorian Walk Gallery just three hours after the exhibit opened. Some of the art world has in general never “taken” to Kinkade’s artwork. Although he has sold millions of dollars worth of prints, paintings, and merchandise, the topic of Kinkade’s art remains heated and controversial. Still, Thomas Kinkade received art training at the Art Center College of Design located in Pasadena. He also studied at the University of California at Berkeley. 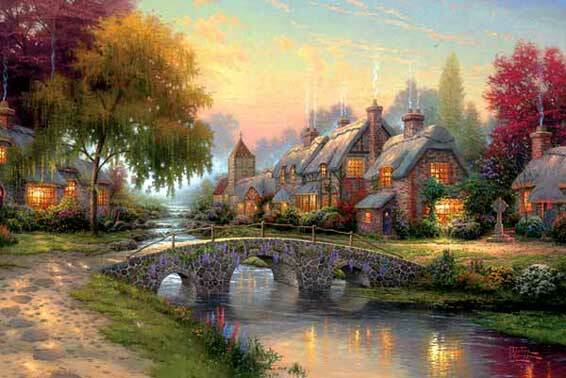 Kinkade was raised in Placerville, California. 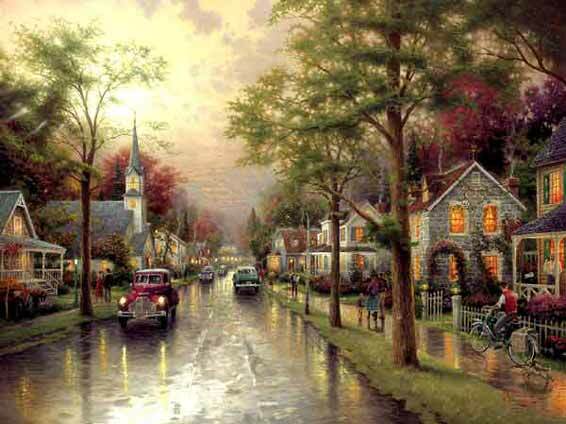 Thomas Kinkade is well known for painting soft, lush, idyllic scenes. He often depicted streams, lovely homes, and nature settings. His passion for creating paintings that evoked emotions of peace is made evident by the artwork he crafted. The “light” that he is so noted for painting is the thread of continuity that runs throughout all his works. Of his own work, the painter was reported to have said, “If people look at my work and are reminded of the way things once were or perhaps the way they could be, then I’ve done my job.” Kinkade’s family members and artwork will undoubtedly cause him to be remembered for generations to come. This entry was posted in Art, Art Gallery, Artist, artist's death, Light, painter, Thomas Kinkade and tagged Art, gallery, Kinkade, kinkade’s, known, Light, Paint by Number, remains, Segmation, thomas, victorian walk gallery on October 4, 2012 by segmation. Think back to when you were a child, easily fascinated by the tiniest things. Maybe you remember the excitement of finding a rainbow on the wall and the joy of discovering the crystal figurine that seemed to magically create this kaleidoscope of color. Perhaps you even spent the afternoon moving that figurine around the house waiting to see where the rainbow would appear next. Do you remember the first time you saw a rainbow through the hazy drizzle after a storm? Your first sunset on a beach? Can you recall that first stained glass window that caught your eye and captured your attention? More importantly, can you call back that simple childlike joy; the pure awe of bearing witness to something so fantastical? It’s hard to do as adults when we are able to wrap our minds around the scientific reasons behind rainbows and light. Currently on display at the De Pury Gallery in London is a unique style of artwork which calls to the surface that simple, childlike wonder. The image above is part of the “Fly to Baku” Contemporary Art Exhibition. The effect is achieved by shining light through Plexiglass airplanes. The arrangement of these airplanes creates the image on the wall. If the mobile of hanging airplanes doesn’t stop you in your tracks, then the picture it creates is sure to amaze. Light has an important relationship with color and with art. Painters go to great lengths to achieve a specific light or a hint of a shadow in their paintings. Those who make stained glass pieces consider how the glass will react to light shining behind it. Sculptures can’t escape light either and seem to constantly change as light rotates around them. Even interior decorators factor in the way light filters through a space when they choose colors and designs. 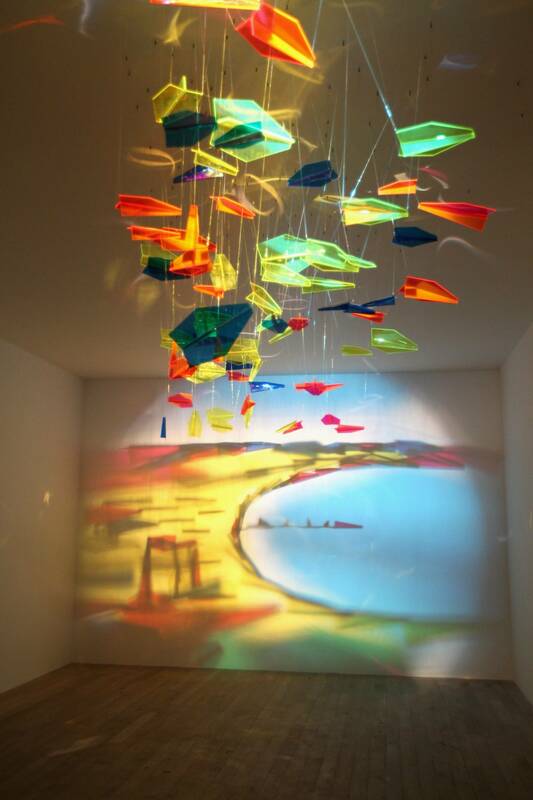 In the case of “Fly to Baku,” light harnessed in little Plexiglass airplanes is actually creating pieces of art. Take a moment to really look at the image above. You may just find yourself entranced by childlike awe. This entry was posted in abstract, Art Appreciation, Art Museum, Children, great images, Light, optical art, paint by number, Patterns, Rainbow, Segmation and tagged airplanes, Art, Baku, childlike, Crafts, glass, image, Light, London, rainbow, Segmation, Stained glass on May 11, 2012 by segmation.